Bossa Studios, the excellent folks behind cack-handed surgery sim Surgeon Simulator, have recently begun hosting monthly VR meet-ups for indie developers at their London studio. They kindly invited me along to sit quietly at the back of the room and watch developers present their Oculus Rift experiments to the assembled audience, everything from a tower defence game in which you play a giant, to a first-person skydiving game in which you chase falling mariachi bands through floating islands. These developers are cowboys clippity clopping around this curious new frontier of game development, the wild west of virtual reality. Sometimes they ask each other questions about planar vertices and trans-parallax array obfuscation, which I don’t understand. But sometimes they show off games like Private Eye, a Rear Window inspired murder mystery in which you play a wheelchair bound snoop armed with a pair of binoculars. That, I do understand. 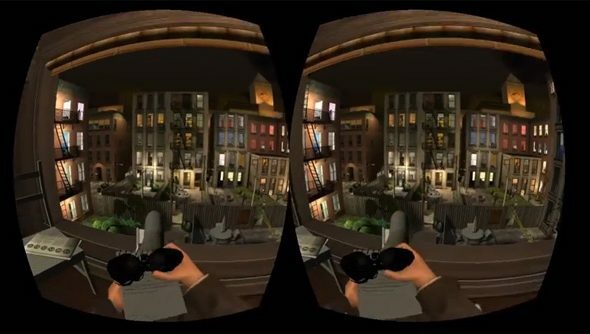 I understand that it is marvellous, one of the most original, compelling and sinister Oculus Rift games yet seen. Holed up in your apartment with a broken leg, you play an immobilised detective with nothing better to do than spy on your mostly curtainless neighbours. 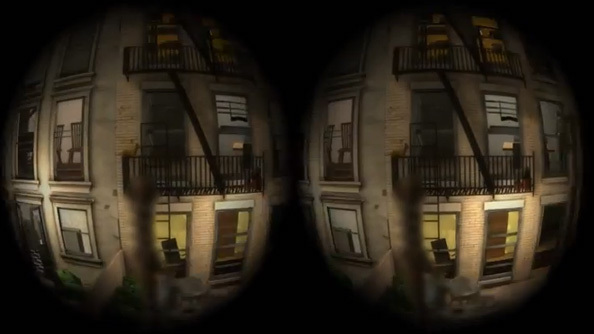 From your window you’re granted a view of about a dozen rooms, and by manually increasing the zoom on your binoculars (by rotating your controller’s analogue stick, no less) you can peer at the most intricate scene details — photographs, pets, paintings, computer screens, each apartment is a trove of unique objects — and track the movements of individual characters. There’s a timely murderer on the loose, and he’s set to kill again at 10pm. There’s a clock tower in the distance to constantly remind you of this fact. Check out how sinister the trailer is. You’ve got a notepad in your left hand listing objectives to be solved in order. First, you must locate the detective on the scene of the murder and follow him to his office, where, by watching him work at his computer, you can swipe his login details to use on your own desktop PC. You’ve also got some less exciting object-finding challenges, things like locating a woman’s apartment by identifying her name on a mailbox outside, before tracking down her wayward cat by first finding a photograph of the missing puss and then zeroing in on the cat itself as it cavorts around on somebody else’s fire escape. Even as it stands right now, Private Eye already expands on the idea that Oculus Rift is best utilised in traditional, seated cockpit games. The view from a wheelchair in Oculus Rift is, weirdly enough, one of the most effectively immersive I’ve experienced with the technology. By its very nature Private Eye sidesteps the disorientating nausea of player movement and instead focuses on observation of mostly static surroundings. The frame of your window gives you a visual mooring point too, which not only keeps your stomach the right way up but grants the shared neighbourhood yard a true sense of space and size. It’s rather more calming than the trailer suggests too, and one of the few games to star a less abled protagonist. Private Eye will be getting a Kickstarter in December to fund its ongoing development.